An eco-friendly destination - Now with air conditioning. 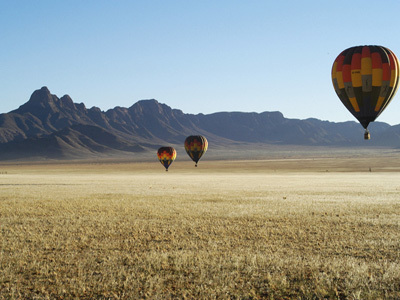 If you have ever dreamt of gliding across the stark red sand dunes of the Namib desert in a hot-air balloon, Sossusvlei Lodge - at the Sesriem gate of the Namib-Naukluft Park in Namibia, should definitely be your destination. The unique architecture of this luxury lodge pays tribute to its African desert surroundings. Building materials such as adobe bricks combine effortlessly with canvas, which arguably makes Sossusvlei Lodge Namibia’s most elegant luxury establishment. Small wonder then that Sossusvlei Lodge was named Namibia’s best lodge in 2006 and has also received a silver award of excellence. 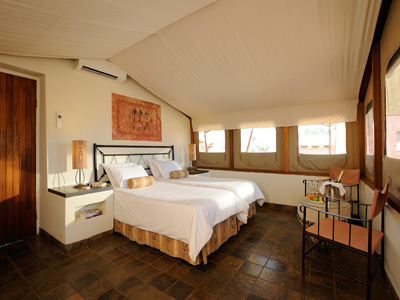 Guests are accommodated in 45 luxury tent rooms, all en-suite with air-conditioning, in sophisticated African style. 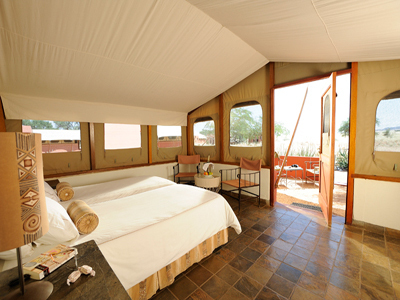 Each room has its own balcony, providing you with a breathtaking view of the surrounding Namib desert. Enjoy a desert swim in the sparkling pool at Sossusvlei Lodge before enjoying an ice-cold Namibian beer (offered on-tap in the bar). Dine in style under the starlit skies of Namibia:traditional Namibian gourmet dishes are complemented by excellent South African wines. Entertainment comes in the form of desert animals - like the springbok and hyena, visiting the nearby floodlit waterhole. 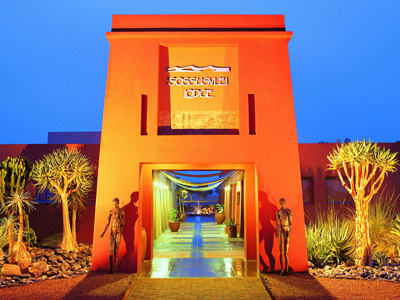 While Sossusvlei Lodge at Sesriem is a luxury lodge, it is also an eco-friendly destination. All lights are solar-powered and the eco-friendly buildings are shaded by camel thorn trees. Due to its proximity to Sesriem, Sossusvlei Lodge offers a number of guided excursions into Sossusvlei and the Namib-Naukluft Park in Namibia. The area is renowned for its giant sand dunes that are ever-changing in shape and colour. Eco-friendly quad bike excursions, scenic flights across the desert, sand boarding, sundowner trips into the desert and hot-air balloon trips will make your stay unforgettable. A breakfast quad bike trip is even on offer, where you can watch the day break across the Namib desert while enjoying a breakfast served on a table made from petrified mud! You can fly from Windhoek, Cape Town or Johannesburg direct to Walvisbay. It might be a rewarding experience to stay your first night in Namibia in Swakopmund and to leave early from Swakopmund to Sossusvlei Lodge. The Swakopmund Hotel and Entertainment Centre will be the best hotel in Swakopmund. This hotel is in the old colonial station and clearly a very upmarket destination. Equally beautiful is The Stiltz a lodge on the Swakopmund River near the main beach. After your visit to Sossusvlei you might consider visiting the other highlight of the Namib Desert namely the Fish River Canyon. Here you can overnight in Canon Lodge near the Fish River, perhaps Namibia's most interesting lodge. The Fish River Canyon is the world's second largest canyon after the Grand Canyon in Arizona. Also near the Canyon is Ai-Ais hot springs resort at the source of a mineral and sulphur rich, hot spring. 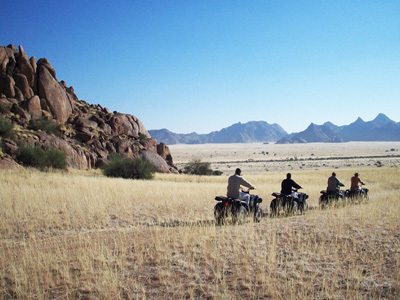 A visit to Damaraland in the north of Namibia might also be a very rewarding experience. While the Namib Desert around Sossusvlei is known for its high sand dunes, Damaraland is known for its fascinating rock formations and Welwitchia plants. 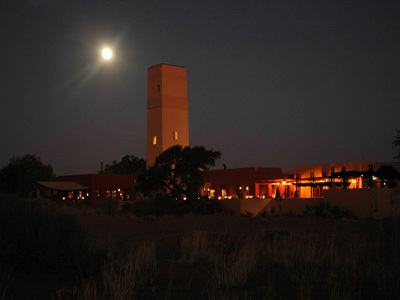 Sossusvlei Lodge strongly recommends Ugab Terrace Lodge near the Vingerklip rock on a hill with breath-taking views. If you want to experience the contrast Namibia has to offer you must combine a visit to the desert of Sossusvlei with the sub-tropical paradise of the Caprivi. In the Caprivi you can stay at Namushasha River Lodge on the banks of the Kwando River. There are a few must see places in Africa. In Namibia it is Sossusvlei with its high sand dunes and in Botswana it is the Okavango Delta with its excellent wildlife. The Thamalakane River lodge is a luxury lodge near Maun in Botswana which is the gateway to the Okavango Delta. Zimbabwe is, as Namibia, a member of the Southern African Development Community. Sossusvlei Lodge is therefore proudly associated with the following lodges in Zimbabwe. You will most likely drive from Sossusvlei via Etosha, Caprivi and Botswana to Zimbabwe. The first place of call will therefore be Victoria Falls where the beautiful Kingdom Hotel is within walking distance of Victoria Falls. The sub-tropical Eastern Highlands of Zimbabwe form a strong contrast with the sand dunes of the Namib Desert. Here we recommend either the Troutbeck Inn Hotel and resort near Nyanga or the five star Leopard Rock Hotel in the Vumba Mountains. Both these hotels have beautiful golf courses. After your visit to the Eastern Highlands you must consider a visit to the ancient Zimbabwe Ruins. Here Sossusvlei Lodge recommends with confidence the beautiful Lodge at the Ancient City from where you see the Great Zimbabwe Monument. If you are in doubt visit Temba Zimbabwe. They are specialists in tours and safaris to Zimbabwe. This website will give you the information you need to plan your Zimbabwe holiday.